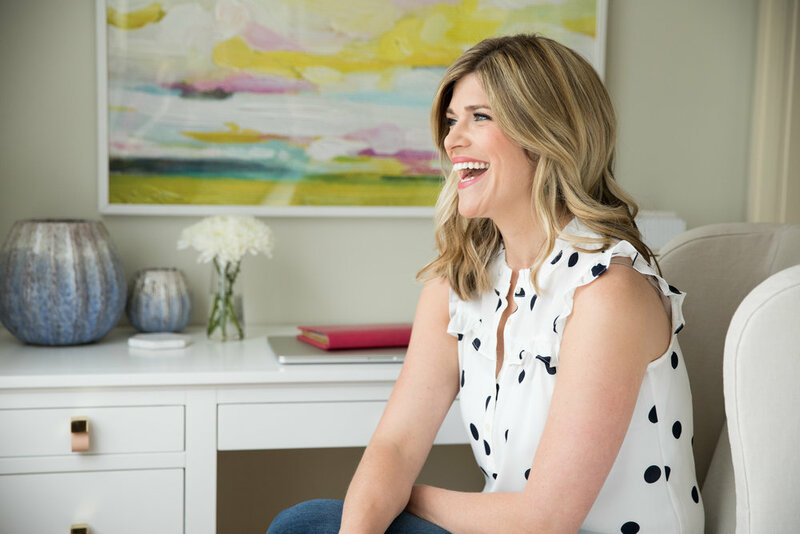 Personal Brand Sessions, What The Heck Are They? Why do I need it? 🤔Strong images give your brand a personality, they show people who you are as a business and what it’s like to work with you. We live in a visual world, and if people can’t see you, they don’t know if they can trust you. I know it’s not easy being in front of the camera, but if you are the face of your brand, YOU need to be involved in the story! What can I expect? You can expect a personalized, customized experience, that clearly communicates your brand story. We start with a questionnaire and consultation to get to know your brand, this is your chance to throw out any ideas, requests, must haves, or definitely-nots. I love the brainstorming process and once we know where we are going, we can start looking at location and wardrobe options. Hair and makeup is always recommended and helps you look and feel your best in front of the camera. It’s always my goal to make you feel comfortable throughout the shoot so we can capture your true personality and of course THIS WILL BE FUN!! What can I do with my images? This list could be 10 pages long but let’s stick with the basics for now. Social media in all its glorious forms! Instagram, Facebook, Twitter, Linked In. 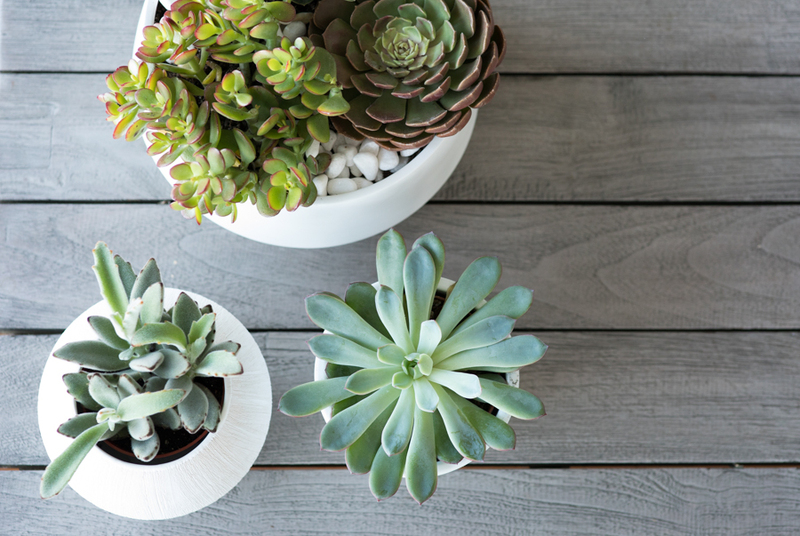 Social media posts that include an image receive 120-180% more visibility and engagement. I bet you can think of at least 10 more that apply to your specific business. I’d love to know what you can come up with for your business! Once I’ve experienced and loved everything about our photoshoot, when can we do it again? YES I hope that’s what everyone says, but honestly, our need for content these days can be overwhelming and it can be so hard to keep up with. Again, everyone has different needs, but we can come up with a plan to shoot weekly, monthly, quarterly, or yearly to keep your content fresh and consistent! What Is The Best Thing You Can Hand Down To Your Kids? FAMILY ALBUMS! It’s no secret I LOVE albums. I love all forms of printed photos, but I really really love albums. Admittedly, I am a book person. I was resistant to my (now beloved) Kindle, it’s just so convenient, but I still can’t wait to get my hands on a good book I can turn the pages of. Do you remember those big, sticky page photo albums our parents had? Yes they are clunky as heck, but there is something special about flipping through the curated pages and seeing the story of Christmas, or someone’s birthday. Much more special than flipping through a hard drive. Today, more than ever before, it’s so easy to take snapshot…after snapshot…after snapshot, until you end up with a million photos on your phone (that is hopefully also backed up to a hard drive). 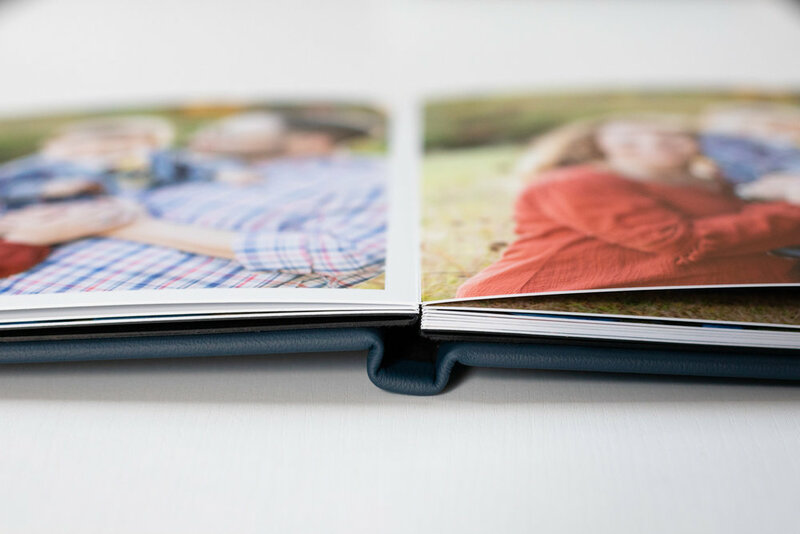 Having our photos digitally is super important, but having the special ones curated and printed in a beautiful, (archival) leatherbound album that you can hand down to your kids, and their grandkids, is an incredible gift. 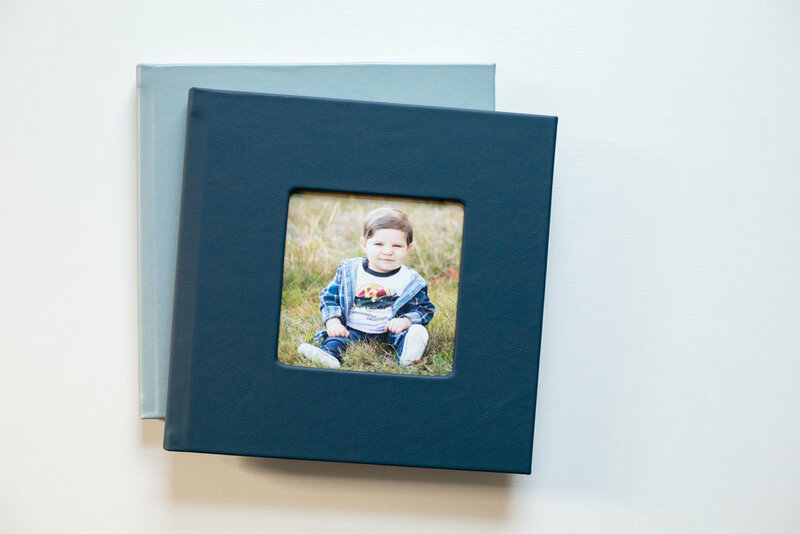 Images boxes (shown below) are another fun “album style” way to print, display, and archive your photos too! It is really special when the younger sibling of a previous client comes to us for their senior portrait. This was the case for Vanessa! We got to shoot with her older sister Alicia two years ago. Now it is Vanessa’s turn to graduate high school and we were so excited to continue this tradition. We photographed Alicia in our historic Lawrence mill buildings, so for Vanessa we decided to mix it up and have her portraits taken at the Plum Island/Newburyport marshes and beaches. After a short hunt for flowers, we found some purple and yellow ones that matched perfectly with the cool blues in her outfits and her amazingly long blonde hair. Vanessa has some serious hair goals! She worked her tresses perfectly in the wind. Halfway through the photoshoot, the sun popped out from behind some clouds and made a dazzling sunset. The soft, peach hues reflected beautifully on the pools of water in the marsh, so it was only fitting in such a dreamy landscape for Vanessa to give her dress a twirl. Finally, we made it to the beach, and we have to say, Vanessa chose the perfect outfit for the setting. All the colors in the background were incorporated in her romper. Vanessa was not afraid of getting a little sandy for her “finale photo” , and as you can see it was totally worth it! Class of 2018 Senior Rep Victoria C introduced us to Taylor. Both of their moms are co-owners of Cupcake City, which by the way are some of the best cupcakes I’ve ever tasted, Twix and Sm’ores are among my favorites, though I’m not opposed to trying every single flavor.... Ok back to Taylor- what a riot this girl is! She brought so much fun and laughter on set. She was not afraid to call it how it is when a pose felt awkward, and we love that! It brings out natural smiles and really represents a subject’s true personality in the photos. Taylor wanted her senior shoot to have an editorial aesthetic, and also to highlight her favorite shoes: Christian Louboutin heels. Naturally, we headed over to the mill buildings for a grunge meets high fashion feel. We played around and laughed so hard as we were trying to capture some movement to show the bottom of her heels, We called this one her “fashion editorial spread” Having started out in a black slouchy sweater, we noticed as the photoshoot progressed her sweater seemed to be growing! Certain fabrics can stretch like crazy throughout a shoot, and Taylor’s sweater seemed intent on growing into a sweater dress. Taylor dealt with it with grace, laughter, and eventually an outfit change. Outfit number two matched perfectly with a rusty basin that we found on the floor (maybe meant to catch drips from the leaky ceiling?). After propping it up, Taylor sat down and worked her unique background. For our final shots, we noticed how beautifully the light was coming into the room, so we moved fast and captured some fun dramatic images. The results are some of our favorite shots of the day! Victoria is another one of our Class of 2018 Senior Reps! We were so excited to shoot with her and her family, mostly because we already knew how much fun they were. We photographed her older brother Chris last year in the same location. 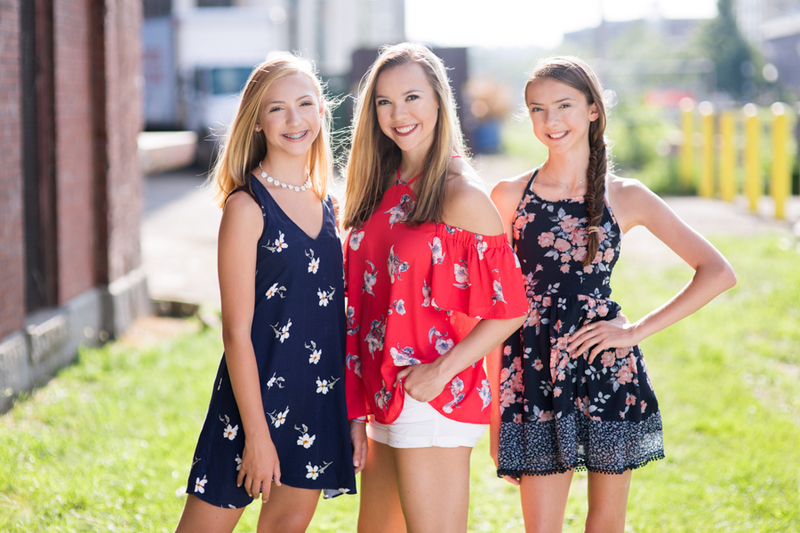 We always encourage our high school seniors to bring siblings, friends, or Mom on their sessions. Victoria’s senior session was a little different because we also were having a family session with her family at the beginning! She got to have Mom, Dad, and Chris cracking jokes and making her smile while she posed for her solo shots later on in the shoot. We met the Cataldo family at Boston Common and started with some group shots on the benches to get everyone relaxed. There were lots of laughter and inside jokes being thrown around between the two siblings, which of course made Mom and Dad laugh too. As we made our way out of the park, and into Back Bay, we stopped to use some of the city's’ unique architecture as our backdrop; the mall, the brownstones, the wrought-iron fences. As the shoot turned into Victoria’s senior shoot, we started to focus more on Victoria’s passion - dance. We are convinced that one day we will see her as the prima ballerina in one of the world’s most prestigious dance companies. Boy does she have skill and drive! We don’t normally show our clients photos during the shoot, but for Victoria, it was important to see her form and how it photographed. And the results are stunning! We ended the shoot on the Charles right as the sun was about to touch the water. People passing by were convinced we were shooting a movie or advertisement, and that Victoria was a celebrity. We can see how they thought so! Who wouldn’t want to skip school for a photoshoot? That’s what senior Brianna got to do for her senior portraits! Brianna is friends and soccer teammates with one of our Senior Reps, Alena. At the crack of 8:30am, we met at the studio for Brianna’s mill building inspired shoot. Right off the bat, Brianna worked it. She has the natural smize down. For those of you who don’t know the Tyra Banks coined term, smize = “smile with your eyes”. And look at all of that hair! It was a bit of a wind storm when we made it outside, but she wrangled all of her long locks effortlessly. I even have to say, that the more windblown her hair got, the better it looked, does this girl ever have a bad hair day?? After a quick outfit change, she pulled out one of our favorite winter accessories: the blanket scarf. Not only is it perfect for a brisk December morning, you can’t help but have some fun with it. Soon Brianna was laughing at having to sway continuously, which brought out her fun, happy personality in the photos. We ended the shoot across the street in the mill buildings. I am beginning to love this early morning winter light in the mills. Showcasing a bright red off the shoulder shirt with the gritty, monochromatic backdrop resulted in Brianna absolutely shining. Rise and shine Joelle! Joelle's original senior photoshoot had been postponed due to rain, so we got up bright and early to be up at the Newburyport Plum Island beaches in time for the beautiful morning sunlight. Not only did she get up early, she was able to do so without coffee - something we cannot do on a normal day. And boy did she rock her photoshoot! It was a little brisk and windy, the perfect weather for the slouchy sweaters she chose for some of her looks. When a gust would hit her sleek long hair just right, the results were gorgeous. We're always interested in what our clients are passionate about. Joelle participates in dance and swimming and it was important for her to represent them in her photos. For dance, she grabbed an old pair of pointe shoes and held them while leaning against a wall. It was simple yet elegant and the results are one of our favorite shots of the day. For swimming, this team captain wanted to show off her jacket. Her mom could not wait to see the album that she was going to order because when her daughter is away at college next year, she'll have this day to look back on. Printed products are SO important to us, and it was clear that they were equally as important to Joelle's mom. She decided to go with the signature album in color, and because she loves black and white so much, a black and white image box. It's not common to go with black and white for this product, but I am in love with how her album AND image box came out! One of our favorite places to photograph is the Boston Public Library courtyard. 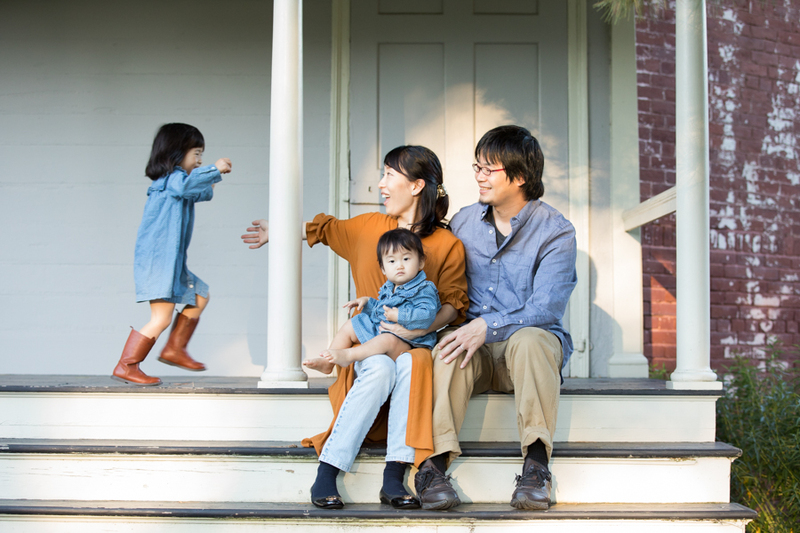 It is a hidden gem in Back Bay, and we had a blast photographing the Tashima Family there. They were all visiting from Chicago and Ohio, and we are so happy they picked Boston for their family photos. They were on a New England vacation together, and Boston was a stop on their way to Bar Harbor, Maine. No one was safe from these cuties tickles and laughter! We like to play a game called, “What’s your favorite animal?” which always entails silly animal noises. The kids’ favorite animals were zebras and penguins, leading to neighs, squawking, and chirping. The jury is still out on what a penguin sounds like. We took a short walk down the street to some of our favorite brownstones and the fun did not stop. From Copley Square to Beacon Street the kids were giggling and smiling the whole way. Mom and Dad got cozy under a tree and the kids snuggled in. 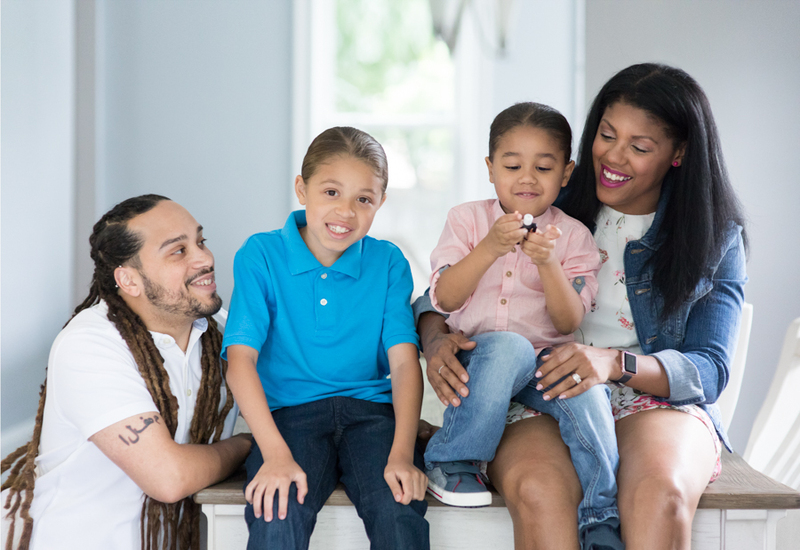 We love capturing these special moments a family has together! Most people don't want rain on their photoshoot, but we always tell them that with afternoon rain comes the most brilliant sunsets. Senior Rep Victoria's shoot was sprinkling a few raindrops when we first started, but that did not put a damper on her fun! With her Bestie Catherine making jokes behind the camera, Victoria was all smiles. In between shots, Victoria was tapping and dancing away as her mom called out her favorite dance moves. A quick outfit change later, we made it on to the beach. This beach is a very special place full of fond memories for Victoria and her family. Their home at the beach was her grandparents, and the bench we shot her on has a beautiful plaque in honor of them. We love photographing clients in places that possess special meaning to them. Victoria was not afraid of getting her feet a little wet and splashed around in the shallow waters. A surprise wave did catch her off guard, but that only made more laughs between her and Catherine. With perfect timing, as we predicted, the rain clouds parted to give way for a stellar sunset just for Victoria.